A half-man, half-beast Digimon with a humanoid upper body and a bestial lower body. 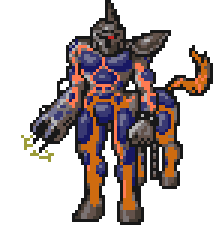 Its body is protected by a hard substance secreted onto the surface from its insides, and its right arm has fused to become one with its weapon. The ducts extending from its back spout high-pressure vapor, allowing it to move at near-sonic speed, though only for an instant. It has outstanding defense, attack, and speed. It is extremely prideful, and absolutely despises being ordered around or restrained. 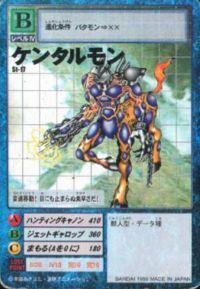 Its Special Move is using the Hunting Cannon which has become one with its right arm. It is near impossible to evade this attack. However, because this attack expends a large amount of energy, Centalmon avoids battle whenever possible. — Digimon Adventure: "Centalmon the Guardian!" 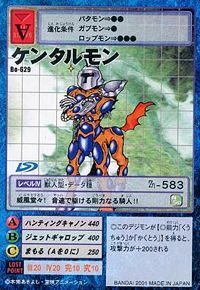 A Digimon with a upper body of a Human Type and a lower body of a animal type Digimon. It is protected by a substance that comes to the surface from its insides, and has a weapon attached to its right arm. The pipes extending from its back gush out high-pressure vapor, which can instantly propel it, and it is possible for it to move close to the speed of sound. It has superior defensive, attack, and speed. It has very high pride, and it dislikes being ordered. 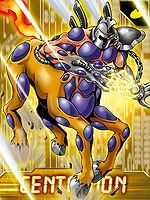 | Cental is a misspelling of centaur (「ケンタル」 Kentaru), a half-man and half-horse creature from Greek mythology. Hunting Cannon  ハンティングキャノン Hantingu Kyanon Solar Ray Shoots a blast of energy from the cannon on its arm. Jet Gallop  ジェットギャロップ Jetto Gyaroppu Jet Kick Uses its jets to gallop forward and kick the opponent with its hind legs. Heat Upper  ヒートアッパー Hīto Appā Heat Uppercut Slams the ground to cause a fiery shock wave, or delivers a red-hot uppercut. 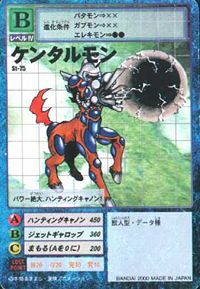 Centalmon from Digimon Frontier using Hunting Cannon. A Centalmon explained some facts about the Digivices to the Chosen Children to them after they freed him from a Black Gear. 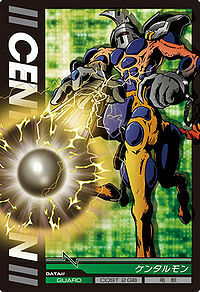 An army of Centalmon was commanded by a Sagittarimon to get his revenge on Angemon for beating him. Centalmon appears as an obtainable Adult-level Data type Digimon in Digimon World. A Centalmon appears hidden in the Amida Forest, where the Player must clear a labyrinth maze. The drawback is that Centalmon will aim and shoot the Player if spotted, sending them flying afterwards and taking away some of the Digimon's HP. To clear the maze, the Player must hide behind the rocks so Centalmon won't spot them and reach the door marked with an "O" sign, otherwise if the "X" sign is shown, the Player must have to redo the maze again. After reaching to the correct door, Centalmon will reveal itself, apologizing for the troubles and joining the Village of Beginnings where it'll open a Centar Clinic, upgrading the healing and rest services of Punimon's where it'll heal more tiredness and HP. Centalmon also opens the door beyond the Ancient Dino Region when recruited. Bonus conditions: Have a Discipline of 60% and have at least 28 different techniques mastered. 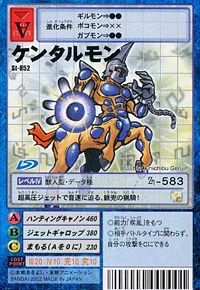 Centalmon's Digivolution item is the Iron Hoof which lets any Child Digimon evolve into Centalmon. Centalmon gathers lightning bolts into its cannon and fires it at the enemy. Centalmon is an obtainable Digimon. 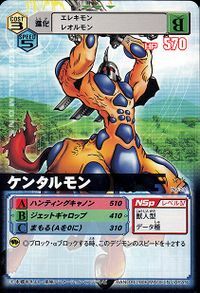 Evolves from Gabumon (0-2 DP) and can evolve to Insekimon (0+ DP). Can be evolved from Lopmon if above level 20 and Machine EXP 480, or found at Trans-field. Can evolve to Black Rapidmon if above level 33, speed 145, and Machine EXP 3500. Evolves from Elecmon, Gaomon, Goburimon or Patamon. Can evolve to Mach Gaogamon, Andromon or Mammon. Centalmon is available as a Digimon Medal. 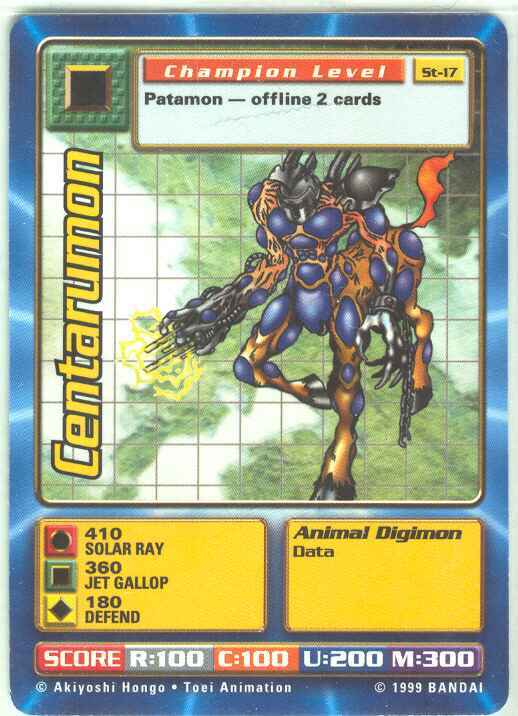 Centalmon is available as a Digimon Card. Evolves from Patamon. Can evolve to Giromon. Centalmon is an enemy Digimon in Area 03. Evolves from Tentomon, Elecmon or Kunemon. Can evolve to Waru Monzaemon. It moves at the speed of sound! It's too fast to see! This iron-helmed hunting knight closes in at the speed of sound using its high-pressure jets! It stands high with dignity! 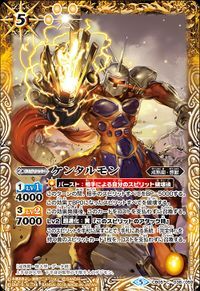 This powerful horseman gallops at the speed of sound!! 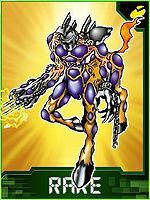 A half-man, half-beast Digimon that has the upper body of a man and the lower body of a beast. Various parts of its body are covered by blue armor, and it can travel close to the speed of sound due to the high-pressure vapor it releases from the ducts on its back. 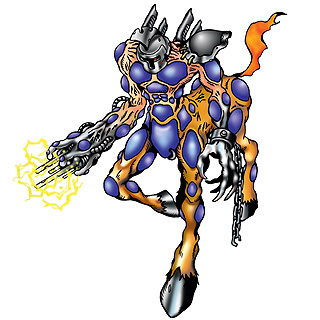 A half-man, half-beast Digimon with a humanoid upper body and a bestial lower body.